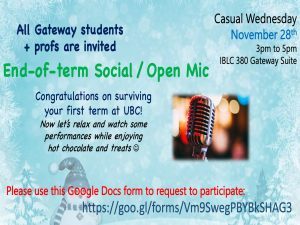 All Gateway Students + Profs are invited to celebrate the end of term one! Please join us for an end of term social and open mic! Perform at the open mic, or join the audience to cheer on the brave hearts! Hosted by 2018W Arts One Student Reps.
PM (Project Manager): Traf LA2.